Alongside their brand refresh, Veggie Grill, a fast-casual vegan restaurant, wanted to redesign their online ordering experience to make it more seamless, engaging, and cohesive within their digital ecosystem. This was the opportunity to design a digital experience based on Veggie Grill's brand principles, deliver on a unique set of user needs, and to transform a white label ordering template to an experience that is more engaging for fans and newcomers alike. Our high level goal was to create a customized web app that is cohesive with the Veggie Grill digital ecosystem while having a considered, seamless, and distinct design that sets it apart from white label ordering apps and delivers on user needs. Deliver on Veggie Grill's unique user needs. The team flew to LA for 3 days for introductions and user research. 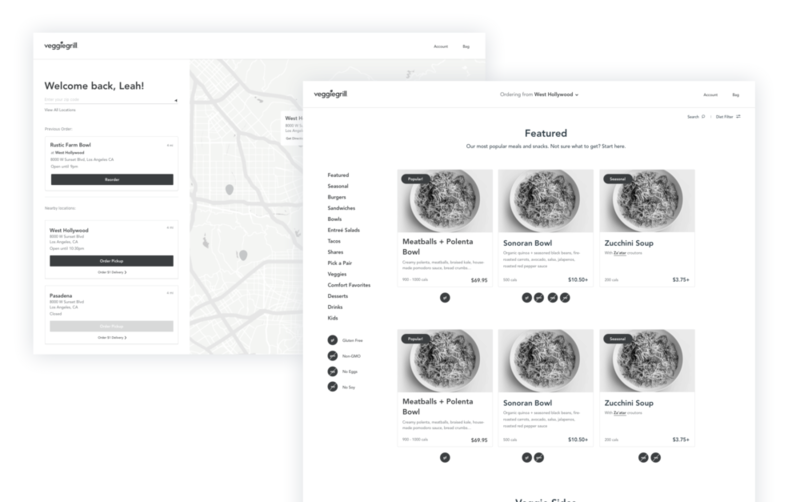 At this point, there was a chance that we wouldn't be able to do user testing, so I set out with the goal to get as much information as I needed about not just usability, but also users relationship with Veggie Grill and what they want out of the Veggie Grill experience. When asked, all interviewees described Veggie Grill as "convenient"
How might we provide an informative experience, akin to in-store? Only a fraction of Veggie Grill's customers have a high knowlege of vegan food, which means most customers will not be very familar with the menu and will be be seeking some sort of guidance when making their choice. How might we make this a seamless experience that stands out from peers and competitors? Most users, especially younger ones, are used to the frictionless experience of other apps. With every interviewee calling Veggie Grill "convenient", it is important that we bring this into the digital experience as well. Applying certain analogous design patterns ensure that users have an easier time navigating through the modification and purchase flow. 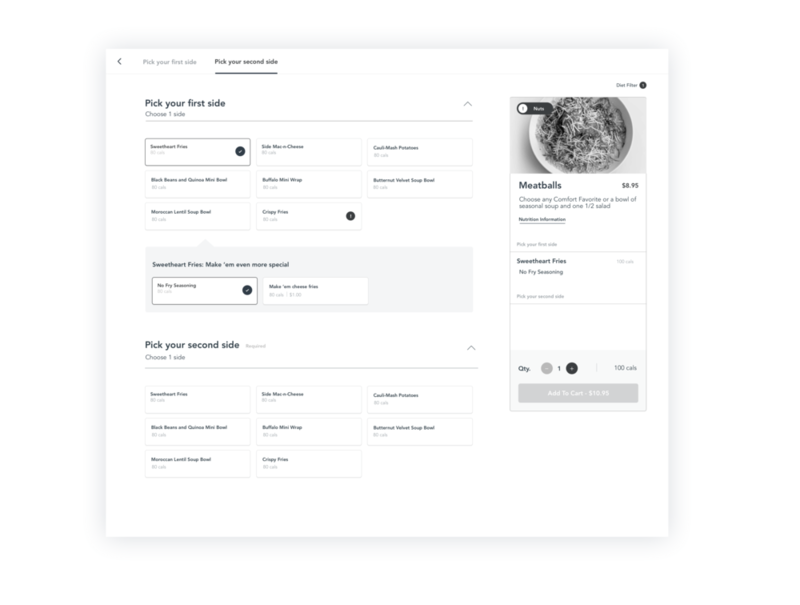 How might we create a flexible ordering flow that works for everyone? Veggie Grill has a higher-than-average number of picky eaters that frequent their restaurants. This system has to be able to handle a high level of customizations and none at all. After speaking to users, we came up with these 4 personas, and defined an experience that would benefit them the most. Inconsistencies between modifications labels and structures were eliminated and the menu was streamlined to be consistent across platforms. With the average Veggie Grill customer being an ingrequent or first-timer, there are lots of questions around the menu and its ingredients. Special/featured ingredients will feature tool tips to help the customer familiarize themselves. Featuring best sellers and highligting popular items aids newcomers in decision making. 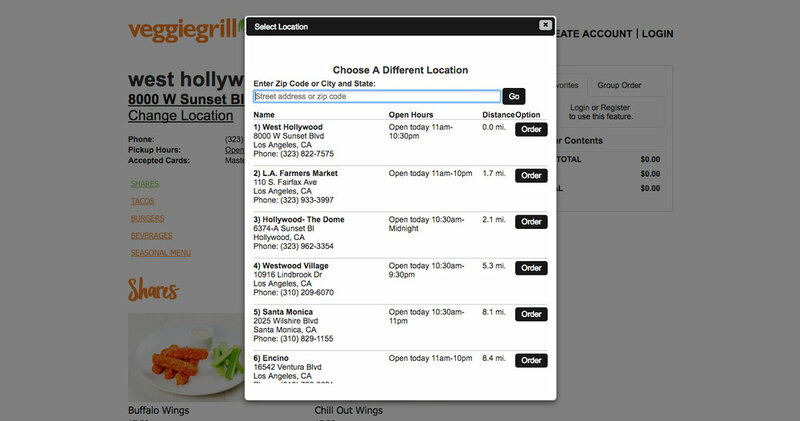 A more robust system of dietary tags per menu item, will aid those customers with special dietary needs. A number of features I wireframeed (dietary tags and tool-tips) were not supported by the OLO backend and would require a customer middle layer of code that was not in scope. Veggie Grill was the "guinea pig" for our new Koala platform at Fuzz, requiring it to be highly versatile for reuse, hurting the amount of customization I originally planned for. The accelerated timeline meant no time for user testing. Because of this, I erred on the side of caution. If I couldn't test with users, didn't want to design something that I wasn't sure of. The new Veggie Grill site launched earlier this year and is live right now! This being my first official product that has shipped as taught me alot. I learned how flexible the process is. With a variety of deliverables, techniques, and methodologies, you can cater your process to fit your needs. No process is perfect! In the end, all of my grievences could be alleviated if I had more time. During user testing, I wish I would have asked more questions that gave me more insight into a users thoughts, actions, and motivations as they modify a menu item.